Home appliance repairIs It Worth the Money to Repair Your Microwave Oven? Microwave ovens. A time-saving essential in today’s kitchen. Over the years, the price of microwaves has come down significantly, so, when something goes wrong with your oven, you have to wonder if it is worth repairing. What is the age of the oven? Is it fairly new or still under warranty or 15 years old? 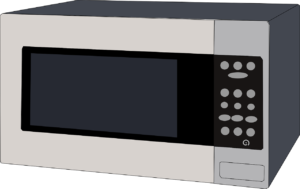 An older microwave is probably not worth the cost of the repair. This may be the sign that it may be time to replace it. Is the microwave part of the stove unit or customized for your kitchen? Both examples may require you to have the oven repaired. When you answer these questions, it’s time to consider what might be wrong with your oven. If it suddenly stopps while in use, it is quite possibly a blown fuse. This is easily fixable. Sparks occurring while in use should have you looking first to the inside of the microwave. Make sure your oven is cleaned of all splatters, grease and debris that may accumulate. If you still have sparks there could be a couple of reasons. This is the time to look back at the answers to the above questions. Turntables that seem off balance may simply need cleaning and realignment. Sometimes the parts just wear out. Look at the turntable and see what is happening. You probably are able to take care of this yourself without calling for repair or replacing the oven. I’d like to caution you on attempting to do any big repair yourself. A microwave oven can give you a serious shock. It is very important that you let an experienced service repair technician handle the repair. Professional repair agents have training on handling the various components in a microwave oven that can be dangerous. So, going back to the original question…Is it worth the money to repair your microwave oven? You are the best person to determine the answer. Seriously consider what your answers are to the two listed questions and whether the repair seems to be simple. Then either start shopping or call for assistance.